In the early days of computing, programmers and developers shared software in order to learn from each other and evolve the field of computing. Eventually the open source notion moved to the way side of commercialization of software in the years 1970-1980. In 1997, Eric Raymond published The Cathedral and the Bazaar, a reflective analysis of the hacker community and free software principles. The paper received significant attention in early 1998, and was one factor in motivating Netscape Communications Corporation to release their popular Netscape Communicator Internet suite as free software. This source code subsequently became the basis behind SeaMonkey, Mozilla Firefox, Thunderbird and KompoZer. While the Open Source Initiative sought to encourage the use of the new term and evangelize the principles it adhered to, commercial software vendors found themselves increasingly threatened by the concept of freely distributed software and universal access to an application's source code. A Microsoft executive publicly stated in 2001 that "open source is an intellectual property destroyer. I can't imagine something that could be worse than this for the software business and the intellectual-property business." However, while FOSS has historically played a role outside of the mainstream of private software development, companies as large as Microsoft have begun to develop official open-source presences on the Internet. IBM, Oracle, Google and State Farm are just a few of the companies with a serious public stake in today's competitive open-source market. There has been a significant shift in the corporate philosophy concerning the development of FOSS. The Open Source Definition, notably, presents an open-source philosophy, and further defines the terms of usage, modification and redistribution of open-source software. Software licenses grant rights to users which would otherwise be reserved by copyright law to the copyright holder. Several open-source software licenses have qualified within the boundaries of the Open Source Definition. The most prominent and popular example is the GNU General Public License (GPL), which "allows free distribution under the condition that further developments and applications are put under the same licence", thus also free. The Open Source Initiative (OSI) was formed in February 1998 by Eric Raymond and Bruce Perens. With at least 20 years of evidence from case histories of closed software development versus open development already provided by the Internet developer community, the OSI presented the "open source" case to commercial businesses, like Netscape. The OSI hoped that the usage of the label "open source", a term suggested by Peterson of the Foresight Institute at the strategy session, would eliminate ambiguity, particularly for individuals who perceive "free software" as anti-commercial. They sought to bring a higher profile to the practical benefits of freely available source code, and they wanted to bring major software businesses and other high-tech industries into open source. Perens attempted to register "open source" as a service mark for the OSI, but that attempt was impractical by trademark standards. Meanwhile, due to the presentation of Raymond's paper to the upper management at Netscape—Raymond only discovered when he read the Press Release, and was called by Netscape CEO Jim Barksdale's PA later in the day—Netscape released its Navigator source code as open source, with favorable results. Despite initially accepting it, Richard Stallman of the FSF now flatly opposes the term "Open Source" being applied to what they refer to as "free software". Although he agrees that the two terms describe "almost the same category of software", Stallman considers equating the terms incorrect and misleading. Critics also oppose the professed pragmatism of the Open Source Initiative, as they fear that the free software ideals of freedom and community are threatened by compromising on the FSF's idealistic standards for software freedom. The FSF considers free software to be a subset of open source software, and Richard Stallman explained that DRM software, for example, can be developed as open source, despite that it does not give its users freedom (it restricts them), and thus doesn't qualify as free software. The proliferation of open-source licenses is a negative aspect of the open-source movement because it is often difficult to understand the legal implications of the differences between licenses. With more than 180,000 open-source projects available and more than 1400 unique licenses, the complexity of deciding how to manage open-source usage within "closed-source" commercial enterprises has dramatically increased. Some are home-grown, while others are modeled after mainstream FOSS licenses such as Berkeley Software Distribution ("BSD"), Apache, MIT-style (Massachusetts Institute of Technology), or GNU General Public License ("GPL"). In view of this, open-source practitioners are starting to use classification schemes in which FOSS licenses are grouped (typically based on the existence and obligations imposed by the copyleft provision; the strength of the copyleft provision). Open source software is usually easier to obtain than proprietary software, often resulting in increased usage. Additionally, the availability of an open source implementation of a standard can increase adoption of that standard. It has also helped to build developer loyalty as developers feel empowered and have a sense of ownership of the end product. Open source development offers the potential for a more flexible technology and quicker innovation. It is said to be more reliable since it typically has thousands of independent programmers testing and fixing bugs of the software. It is flexible because modular systems allow programmers to build custom interfaces, or add new abilities to it and it is innovative since open source programs are the product of collaboration among a large number of different programmers. The mix of divergent perspectives, corporate objectives, and personal goals speeds up innovation. Not all OSS initiatives have been successful, for example SourceXchange and Eazel. Software experts and researchers who are not convinced by open source's ability to produce quality systems identify the unclear process, the late defect discovery and the lack of any empirical evidence as the most important problems (collected data concerning productivity and quality). It is also difficult to design a commercially sound business model around the open source paradigm. Consequently, only technical requirements may be satisfied and not the ones of the market. In terms of security, open source may allow hackers to know about the weaknesses or loopholes of the software more easily than closed-source software.It depends on control mechanisms in order to create effective performance of autonomous agents who participate in virtual organizations. 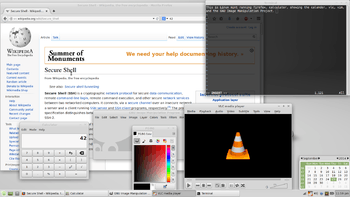 Some of the "more prominent organizations" involved in OSS development include the Apache Software Foundation, creators of the Apache web server; the Linux Foundation, a nonprofit which as of 2012 employed Linus Torvalds, the creator of the Linux operating system kernel; the Eclipse Foundation, home of the Eclipse software development platform; the Debian Project, creators of the influential Debian GNU/Linux distribution; the Mozilla Foundation, home of the Firefox web browser; and OW2, European-born community developing open source middleware. New organizations tend to have a more sophisticated governance model and their membership is often formed by legal entity members. ↑ Rothwell, Richard (2008-08-05). "Creating wealth with free software". Free Software Magazine. Retrieved 2008-09-08. ↑ "Standish Newsroom — Open Source" (Press release). Boston. 2008-04-16. Retrieved 2008-09-08. 1 2 3 Karl Fogel (2016). "Producing Open Source Software - How to Run a Successful Free Software Project". O'Reilly Media. Retrieved 2016-04-11. But the problem went deeper than that. The word "free" carried with it an inescapable moral connotation: if freedom was an end in itself, it didn't matter whether free software also happened to be better, or more profitable for certain businesses in certain circumstances. Those were merely pleasant side effects of a motive that was, at its root, neither technical nor mercantile, but moral. Furthermore, the "free as in freedom" position forced a glaring inconsistency on corporations who wanted to support particular free programs in one aspect of their business, but continue marketing proprietary software in others. ↑ "History of the OSI". Opensource.org. ↑ B. Charny (3 May 2001). "Microsoft Raps Open-Source Approach,". CNET News. ↑ Jeffrey Voas, Keith W. Miller & Tom Costello. Free and Open Source Software. IT Professional 12(6) (November 2010), pg. 14–16. ↑ Eric S. Raymond. "Goodbye, "free software"; hello, "open source"". catb.org. The problem with it is twofold. First, ... the term "free" is very ambiguous ... Second, the term makes a lot of corporate types nervous. ↑ Raymond, Eric S. (1998-02-08). "Goodbye, "free software"; hello, "open source"". Retrieved 2008-08-13. After the Netscape announcement broke in January I did a lot of thinking about the next phase -- the serious push to get "free software" accepted in the mainstream corporate world. And I realized we have a serious problem with "free software" itself. Specifically, we have a problem with the term "free software", itself, not the concept. I've become convinced that the term has to go. ↑ "Open Standards, Open Source Adoption in the Public Sector, and Their Relationship to Microsoft's Market Dominance by Tony Casson, Patrick S. Ryan :: SSRN". Papers.ssrn.com. Retrieved 2015-03-30. ↑ Holtgrewe, Ursula (2004). "Articulating the Speed(s) of the Internet: The Case of Open Source/Free Software.". Time & Society. 13: 129–146. doi:10.1177/0961463X04040750. ↑ "Open Source Pioneers Meet in Historic Summit". 1998-04-14. Retrieved 2014-09-20. ↑ "MOUNTAIN VIEW, Calif., April 1 /PRNewswire/ -- Netscape Communications and open source developers are celebrating the first anniversary, March 31, 1999, of the release of Netscape's browser source code to mozilla.org". Netscape Communications. 1999-03-31. Retrieved 2013-01-10. [...]The organization that manages open source developers working on the next generation of Netscape's browser and communication software. This event marked a historical milestone for the Internet as Netscape became the first major commercial software company to open its source code, a trend that has since been followed by several other corporations. Since the code was first published on the Internet, thousands of individuals and organizations have downloaded it and made hundreds of contributions to the software. Mozilla.org is now celebrating this one-year anniversary with a party Thursday night in San Francisco. ↑ "International Authority & Recognition". Opensource.org. ↑ "List of OSI Affiliates". Opensource.org. ↑ "OSI Affiliate Agreement". Opensource.org. ↑ The Open Source Definition by Bruce Perens. January 1999. ISBN 1-56592-582-3. ↑ "How Many Open Source Licenses Do You Need? – Slashdot". News.slashdot.org. 2009-02-16. Retrieved 2012-03-25. ↑ Open Source Initiative. "The Open Source Definition (Annotated)". opensource.org. Retrieved 22 July 2016. ↑ Tiemann, Michael. "History of the OSI". Open Source Initiative. Archived from the original on 24 September 2006. Retrieved 13 May 2014. ↑ Stallman, Richard (June 16, 2007). "Why "Open Source" misses the point of Free Software". Philosophy of the GNU Project. Free Software Foundation. Retrieved July 23, 2007. As the advocates of open source draw new users into our community, we free software activists have to work even more to bring the issue of freedom to those new users' attention. We have to say, 'It's free software and it gives you freedom! '—more and louder than ever. Every time you say 'free software' rather than 'open source,' you help our campaign. 1 2 Stallman, Richard (June 19, 2007). "Why "Free Software" is better than "Open Source"". Philosophy of the GNU Project. Free Software Foundation. Retrieved July 23, 2007. Sooner or later these users will be invited to switch back to proprietary software for some practical advantage Countless companies seek to offer such temptation, and why would users decline? Only if they have learned to value the freedom free software gives them, for its own sake. It is up to us to spread this idea—and in order to do that, we have to talk about freedom. A certain amount of the 'keep quiet' approach to business can be useful for the community, but we must have plenty of freedom talk too. 1 2 Stallman, Richard (June 16, 2007). "Why "Open Source" misses the point of Free Software". Philosophy of the GNU Project. Free Software Foundation. Retrieved July 23, 2007. Under the pressure of the movie and record companies, software for individuals to use is increasingly designed specifically to restrict them. This malicious feature is known as DRM, or Digital Restrictions Management (see DefectiveByDesign.org), and it is the antithesis in spirit of the freedom that free software aims to provide. [...] Yet some open source supporters have proposed 'open source DRM' software. Their idea is that by publishing the source code of programs designed to restrict your access to encrypted media, and allowing others to change it, they will produce more powerful and reliable software for restricting users like you. Then it will be delivered to you in devices that do not allow you to change it. This software might be 'open source,' and use the open source development model; but it won't be free software, since it won't respect the freedom of the users that actually run it. If the open source development model succeeds in making this software more powerful and reliable for restricting you, that will make it even worse. ↑ Rosen, Lawrence. "Joint Works - Open Source Licensing: Software Freedom and Intellectual Property Law". flylib.com. Retrieved 22 July 2016. ↑ Andrew T. Pham, Verint Systems Inc. and Matthew B. Weinstein and Jamie L. Ryerson. "Easy as ABC: Categorizing Open Source Licenses"; www.IPO.org. June 2010. ↑ Shiels, Maggie (2008-08-14). "Legal milestone for open source". BBC News. Retrieved 2008-08-15. ↑ Archived 15 November 2007 at the Wayback Machine. ↑ Archived 7 December 2007 at the Wayback Machine. 1 2 3 Raymond, Eric S. (2000-09-11). "The Cathedral and the Bazaar". Retrieved 2004-09-19. ↑ Robles, Gregorio (2004). "A Software Engineering Approach to Libre Software" (PDF). In Robert A. Gehring, Bernd Lutterbeck. Open Source Jahrbuch 2004 (PDF). Berlin: Technical University of Berlin. Retrieved 2005-04-20. ↑ Ghosh, R.A.; Robles, G.; Glott, R. (2002). "Free/Libre and Open Source Software: Survey and Study Part V.". Maastricht: International Institute of Infonomics. ↑ US Department of Defense. "Open Source Software FAQ". Chief Information Officer. Retrieved 22 July 2016. 1 2 Sharma, Srinarayan; Vijayan Sugumaran; Balaji Rajagopalan (2002). "A framework for creating hybrid-open source software communities" (PDF). Info Systems Journal. 12: 7–25. doi:10.1046/j.1365-2575.2002.00116.x. ↑ Landry, John; Rajiv Gupta (September 2000). "Profiting from Open Source". Harvard Business Review. doi:10.1225/F00503. ↑ Reynolds, Carl; Jeremy Wyatt (February 2011). "Open Source, Open Standards, and Health Care Information Systems". JMIR. 13. doi:10.2196/jmir.1521. Retrieved 2011-03-17. ↑ Plotkin, Hal (December 1998). "What (and Why) you should know about open-source software". Harvard Management Update: 8–9. doi:10.1225/U9812D. ↑ Payne, Christian (February 2002). "On the Security of Open Source Software". Info Systems Journal. 12 (1): 61–78. doi:10.1046/j.1365-2575.2002.00118.x. ↑ "GNU Classpath Hacker's Guide: GNU Classpath Hacker's Guide". Gnu.org. 2003-08-11. Retrieved 2012-03-25. ↑ Meffert, Klaus; Neil Rotstan (2007). "Brief summary of coding style and practice used in JGAP". Java Genetic Algorithms Package. Retrieved 2008-09-08. ↑ Tripp, Andy (2007-07-16). "Classpath hackers frustrated with slow OpenJDK process". Javalobby. 1 2 Stamelos, Ioannis; Lefteris Angelis; Apostolos Oikonomou; Georgios L. Bleris (2002). "Code Quality Analysis in Open Source Software Development" (PDF). Info System Journal. 12: 43–60. doi:10.1109/MS.2007.2. Retrieved 2008-09-08. ↑ Gallivan, Michael J. (2001). "Striking a Balance Between Trust and Control in a Virtual Organization: A Content Analysis of Open Source Software Case Studies". Info Systems Journal. 11 (4): 277–304. doi:10.1111/j.1365-2575.2001.00108.x. 1 2 3 Boldyreff, Cornelia; Lavery, Janet; Nutter, David; Rank, Stephen. "Open Source Development Processes and Tools" (PDF). Flosshub. Retrieved 22 July 2016. ↑ Stansberry, Glen (18 September 2008). "7 Version Control Systems Reviewed – Smashing Magazine". Smashing Magazine. Retrieved 22 July 2016. 1 2 Frantzell, Lennart. "GitHub, Launchpad and BitBucket, how today's distributed version control systems are fueling the unprecendented global open source revolution". IBM developerworks. Retrieved 22 July 2016. ↑ Baker, Jason. "Top 4 open source issue tracking tools". opensource.com. Retrieved 22 July 2016. ↑ François Letellier (2008), Open Source Software: the Role of Nonprofits in Federating Business and Innovation Ecosystems, AFME 2008. ↑ Open Source Software Institute. "Home". Open Source Software Institute. Retrieved 22 July 2016. ↑ Hellekson, Gunnar. "Home". Open Source for America. Retrieved 2012-03-25. ↑ from EntandoSrl (Entando ). "Mil-OSS". Mil-OSS. Retrieved 2012-03-25. ↑ Popp, Dr. Karl Michael; Meyer, Ralf (2010). Profit from Software Ecosystems: Business Models, Ecosystems and Partnerships in the Software Industry. Norderstedt, Germany: Books on Demand. ISBN 9783839169834. ↑ Irina Guseva (@irina_guseva) (2009-03-26). "Bad Economy Is Good for Open Source". Cmswire.com. Retrieved 2012-03-25. ↑ "Open Source vs. Proprietary Software". PCWorld Business Center. Pcworld.com. 2011-11-03. Retrieved 2012-03-25. ↑ Geoff Spick (@Goffee71) (2009-10-26). "Open Source Movement Finds Friends at the White House". Cmswire.com. Retrieved 2012-03-25. ↑ "Pandora's box for open source – CNET News". News.cnet.com. 2004-02-12. Retrieved 2012-03-25. ↑ Murphy, David (2010-08-15). "Survey: 98 Percent of Companies Use Open-Source, 29 Percent Contribute Back". News & Opinion. PCMag.com. Retrieved 2012-03-25. 1 2 "Homeland Security helps secure open-source code – CNET News". News.cnet.com. Retrieved 2012-03-25. ↑ Greenley, Neil. "Open Source Software Survey". Retrieved 9 October 2012. ↑ Boulanger, A. (2005). Open-source versus proprietary software: Is one more reliable and secure than the other? IBM Systems Journal, 44(2), 239-248. ↑ Seltzer, Larry (2004-05-04). "Is Open-Source Really Safer?". PCMag.com. Retrieved 2012-03-25. ↑ Michelle Delio. "Linux: Fewer Bugs Than Rivals". Wired.com. Retrieved 2016-05-23. 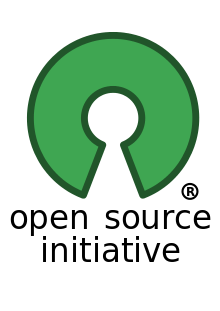 ↑ "Why Open Source Misses the Point of Free Software – GNU Project – Free Software Foundation". Gnu.org. Retrieved 2015-03-30. ↑ "Goodbye, "free software"; hello, "open source"". The problem with it is twofold. First, ... the term "free" is very ambiguous ... Second, the term makes a lot of corporate types nervous. ↑ Stallman, Richard (2007-06-16). "Why "Open Source" misses the point of Free Software". Philosophy of the GNU Project. GNU Project. Retrieved 2007-07-23. ↑ Tiemann, Michael (19 September 2006). "History of the OSI". Open Source Initiative. Retrieved 23 August 2008. ↑ Nelson, Russell (2007-03-26). "Certification Mark". Open Source Initiative. Archived from the original on 2008-02-06. Retrieved 2007-07-22. ↑ Raymond, Eric S. (1998-11-22). "OSI Launch Announcement". Open Source Initiative. Retrieved 2007-07-22. ↑ Nelson, Russell (2006-09-19). "Open Source Licenses by Category". Open Source Initiative. Retrieved 2007-07-22. ↑ "Microsoft announces expansion of Shared Source Initiative". Geekzone.co.nz. 2005-03-21. Retrieved 2015-03-30. ↑ "OSI Approves Microsoft License Submissions". opensource.org. 2007-10-17. Retrieved 2013-08-08. Acting on the advice of the License Approval Chair, the OSI Board today approved the Microsoft Public License (Ms-PL) and the Microsoft Reciprocal License (Ms-RL). The decision to approve was informed by the overwhelming (though not unanimous) consensus from the open source community that these licenses satisfied the 10 criteria of the Open Source definition, and should therefore be approved. ↑ Berlind, David (2006-11-21). "Are SugarCRM, Socialtext, Zimbra, Scalix and others abusing the term "open source?"". ZDNet. Retrieved 2008-01-04. ↑ "SCILAB License". INRIA. Retrieved 2008-01-04. ↑ Noyes, Katherine. "Open Source Software Is Now a Norm in Businesses". PCWorld. Retrieved 22 July 2016. ↑ Stallman, Richard (September 24, 2007). "Why "Open Source" misses the point of Free Software". Philosophy of the GNU Project. Free Software Foundation. Retrieved December 6, 2007. However, not all of the users and developers of free software agreed with the goals of the free software movement. In 1998, a part of the free software community splintered off and began campaigning in the name of 'open source.' The term was originally proposed to avoid a possible misunderstanding of the term 'free software,' but it soon became associated with philosophical views quite different from those of the free software movement. ↑ "What is open source?". Retrieved July 29, 2013. ↑ "Open Collaboration Bitcoin". Informs.org. 2014-01-02. Retrieved 2015-03-30. Androutsellis-Theotokis, Stephanos; Spinellis, Diomidis; Kechagia, Maria; Gousios, Georgios (2010). "Open source software: A survey from 10,000 feet" (PDF). Foundations and Trends in Technology, Information and Operations Management. 4 (3–4): 187–347. doi:10.1561/0200000026. ISBN 978-1-60198-484-5. Chris DiBona and Sam Ockman and Mark Stone, ed. (1999). Open Sources: Voices from the Open Source Revolution. O'Reilly. ISBN 1-56592-582-3. Joshua Gay, ed. (2002). Free Software, Free Society: Selected Essays of Richard M. Stallman (PDF). Boston: GNU Press, Free Software Foundation. ISBN 1-882114-98-1.